This salon's styles are to die for. But as Cassidi wades through the myriad of suspects in the small coastal town, the killer sets his sights straight on everyone's favorite stylist. If Cassidi doesn't watch her back, she may just end up Danger Cove's latest fashionable victim. About Danger Cove: Danger Cove is a sleepy little town in the Pacific Northwest and home to renowned mystery novelist Elizabeth Ashby. While Elizabeth swears the stories she writes are fiction, you can find the inspiration for her murderous tales all over Danger Cove...from the intriguing cast of local characters to the places to eat, play, and explore in Danger Cove. Don't let our name fool you - we're the friendliest (even if deadliest) town in the Pacific Northwest! Other times, family can be a curse.... A paid for Victorian? Awesome! The fact that it’s a former whorehouse, full of quite explicit erotica? Less awesome. Cassidi has great things happening, and then she has murder, drug dealing, conspiracy and mayhem. This is a fun, stand alone mystery. The Danger Cove series is a group of authors writing stories set in the same town. While a few characters cross over, each book is complete in itself. Overall, it’s a good story with adequate narration. Kudos to authorTraci Andrighetti. IMO narrator Kayla Perillo is good, not great. I do feel she will get better with each performance. This is the first book I have read from this author and I will definitely be reading more. She does an amazing job writing a mystery that keeps you guessing till the end. The story line is also really good with entertain characters. I highly recommend mystery lovers to read this book! The story is a fun, light-hearted murder mystery with the perfect setting. The narrator truly brought every character to life which made it incredibly easy to stay engaged and keep characters straight. Will definitely be looking out for the next one! Deadly Dye and a Soy Chai is a fun, light-hearted mystery that stays serious enough to keep interesting, but light-hearted enough to make it very enjoyable and easy to listen to. The narration was fantastic and really enhanced the story with different voices and accents to bring the characters to life, and her voice is great to listen to. I hope another audiobook follows soon! This is the first book in this series that I have listened to but it won't be the last. I knew Traci Andrighetti to be a great writer as I love her Fanki Amato series so thought I would give this book a go, so glad I did as she didn't disappoint. I don't think it is quiet as funny as her Fanki books but it follows the same light hearted humour with great characters. How do you keep a new business up and running when one of your customers dies under the dryer and one of your employees is accused of the unusual murder, oh and the shop you work in used to be owned by ladies of the night and there decor is still plainly visible Things really steam up when somebody starts planting evidence and it a race against time to so love the murder before the police make an arrest. This was the first time I heard this narrator and found her speaking to pleasant and easy to listen too. Over all a good book! Deadly Dye and a Soy Chai was such an exciting book to listen to. As a fan of murder mysteries, I found myself invested in the happenings of Danger Cove and was consistently on the edge of my seat waiting to peg suspects and solve it myself! What's more, Kayla Perillo served as an excellent narrator, seamlessly transitioning between a myriad of accents - which isn't easy! This series is really well written, the characters are well developed and you really enjoy getting to know each character which pulls you into the story line (that is a true art - not all authors do that). The mystery is well plotted and you enjoy trying to figure out "who dunnit!" Although the narrator had a nice voice, it just didn't impress me. It felt like she was just reading the story rather than bringing it to life. I almost listened to the book in 1 setting because the story really drew me in. I was given this free review copy audiobook at my request and have voluntarily left this review. 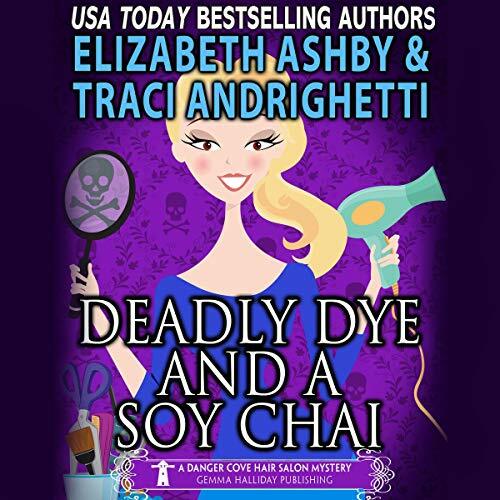 Deadly Dye and a Soy Chai: Danger Cove Mysteries, Volume 5 by Traci Andrighetti and Elizabeth Ashby, narrated by Kayla Perillo is one I was excited to listen to, since I'm a huge fan of Andrighetti's series, Franki Amato Mysteries. While it was entertaining, I think I would have enjoyed reading it more than I did listening. This is the first book I've listened to in the series, and it works as a stand-alone. I don't think it is as funny as Andrighetti's other work, but it has its moments. If you are a cozy mystery fan, you will enjoy it. I listen to audiobooks all the time. Over the years, I've developed my own preferences, likes, and dislikes regarding the narration of a piece. What may not have bothered me when I first started listening years ago, might now stick out and take away from my overall listening experience. In this case, I was not a fan of the narration; the quality seemed like it could have been better. The "white noise" in the background and the changes in sound, volume, and voice at some of the chapter breaks were distracting. This is the first time I have listened to Kayla Perillo perform as a narrator. She stayed in character throughout, but I just feel it could have been better. Everyone deserves a second chance, though, so if I come across her work again, I will give it a try. I just hope the recording of it is of higher quality, making it less distracting to the listener, overall. I don't like being negative, but my reviews wouldn't be helpful to anyone if I wasn't truthful. It's also important to remember this is just my opinion, and you may actually feel the exact opposite. Had I read Deadly Dye and a Soy Chai, my rating may have been higher, in this case, but being that I only listened, my overall rating is between 3.5-3.7 out of 5 stars. I'm a HUGE fan of Andrighetti's work, but this one just wasn't my favorite. For now, I'm going to stick with her Franki Amato series (which I highly recommend!). Happy listening!